Education in the Philippines is managed and regulated by the Department of Education, commonly referred to as the DepEd in the country. The Department of Education controls the Philippine education system, including the curriculum used in schools and the allocation of funds. It also regulates the construction of schools and other educational facilities and the recruitment of teachers and staff. Before Philippine independence in 1946, the country's education system was patterned on the system of its colonial powers, Spain and the United States. However, after Philippine independence, its educational system changed radically. Until 2011, the basic education system was composed of six years of elementary education starting at the age of 6, and four years of high school education starting at the age of 12. Further education was provided by technical or vocational schools, or in higher education institutions such as universities. Although the 1987 Constitution stated that elementary education was compulsory, this was never enforced. In 2011, the country started to transition from its old 10-year basic educational system to a K-12 educational system, as mandated by the Department of Education. The new 12-year system is now compulsory, along with the adoption of new curriculum for all schools (see 2010s and the K-12 program). The transition period will end with the 2017-2018 school year, which is the graduation date for the first group of students who entered the new educational system. 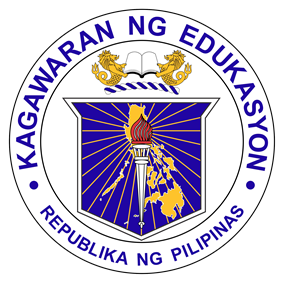 All public schools in the Philippines must start classes on the date mandated by the Department of Education (usually the first Monday of June), and must end after each school completes the mandated 200-day school calendar organized by the Department of Education (usually around the third week of March to the second week of April). Private schools are not obliged to abide by a specific date, but must open classes no later than the last week of August. During the pre-colonial period, education was decentralized. Children were provided with vocational training but little in the way of traditional academics. Philippine schools were headed by parents or by their tribal tutors. Stories, songs, poetry and dances were passed from generation to generation through oral tradition. They employed a unique writing system known as Baybayin. When the Spanish first arrived in Manila, they were surprised to find a population with a literacy rate higher than that of Madrid. 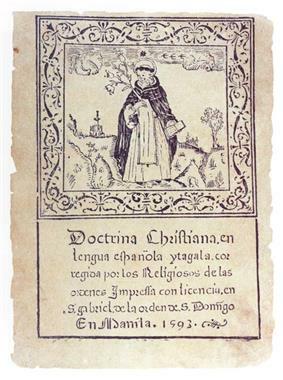 During the early Spanish period, most education was conducted by religious orders. Friars, recognizing the value of the literate indigenous population, built printing presses to produce material in baybayin. Missionaries studied the local languages and the baybayin writing system to better communicate with the local populations and teach Christianity. The church and the school cooperated to ensure that Christian villages had schools for students to attend. Spanish missionaries established schools immediately after reaching the islands. The Augustinians opened a school in Cebu in 1565. The Franciscans, immediately took to the task of improving literacy in 1577, aside from the teaching of new industrial and agricultural techniques. The Jesuits followed in 1581, as well as the Dominicans in 1587, and they started a school in their first mission at Bataan. In 1590, the Universidad de San Ignacio was founded in Manila by the Jesuits, and was incorporated into the University of Santo Tomas, College of Medicine and Pharmacy following the suppression of the Jesuits. The first book printed in the Philippines dates back to 1590. It was a Chinese language version of Doctrina Christiana. A Spanish and Tagalog version, in both Latin script and the locally used baybayin script, was later printed in 1593. “ Let us therefore study, my countrymen, for although the art of learning is somewhat difficult, yet if we are persevering, we shall soon improve our knowledge. Other Tagalogs like us did not take a year to learn the Spanish language when using my book. This good result has given me satisfaction and encouraged me to print my work, so that all may derive some profit from it. In 1640, the Universidad de San Felipe de Austria was established in Manila. It was the first public university in the Philippines. On April 28, 1611, the University of Santo Tomas was founded in Manila as the Colegio de Nuestra Señora del Santisimo Rosario. By the end of the 16th century, several religious orders had established charity hospitals all over the archipelago and provided the bulk of public services. These hospitals also became the setting for rudimentary scientific research work on pharmacy and medicine. The Jesuits also founded the Colegio de San Jose in 1601 and took over the management in what later became Escuela Municipal in 1859. Escuela Municipal was later renamed to Ateneo Municipal de Manila in 1865, and is known today as Ateneo de Manila University). The Dominicans founded the Colegio de San Juan de Letran in 1620 in Manila. The Educational Decree of 1863 created a free public education system in the Philippines that was run by the government. It was the first such education system in Asia. The decree mandated the establishment of at least one primary school for boys and one for girls in each town under the responsibility of the municipal government, as well as the establishment of a normal school for male teachers under the supervision of the Jesuits. Primary education was free and available to every Filipino, regardless of race or social class. Contrary to what the propaganda of the Spanish–American War tried to depict, they were not religious schools, but schools that were established, supported, and maintained by the Spanish Government. In 1866, the total population of the Philippines was 4,411,261. The total number of public schools for boys was 841, and the number of public schools for girls was 833. The total number of children attending those schools was 135,098 for boys, and 95,260 for girls. In 1892, the number of schools had increased to 2,137, of which 1,087 were for boys, and 1,050 for girls. By 1898, enrollment in schools at all levels exceeded 200,000 students. Because of the implementation of public education, a new social class of educated Filipinos arose, the Ilustrados ('enlightened ones'). This new, well-educated middle class of Filipinos would later lead the Philippine independence movement, using Spanish as their common language. Among the Ilustrados who had also studied in Spain were José Rizal, Graciano López Jaena, Marcelo H. del Pilar, Mariano Ponce, and Antonio Luna, who were later to lead the cause of Filipino self-government and independence. The defeat of Spain following the Spanish-American War led to the short-lived independence movement, which established the insurgent First Philippine Republic. The schools maintained by Spain for more than three centuries were closed briefly, but were reopened on August 29, 1898 by the Secretary of Interior. The Burgos Institute (the country's first law school), the Academia Militar (the country's first military academy), and the Literary University of the Philippines were established. Article 23 of the Malolos Constitution mandated that public education would be free and obligatory in all schools of the nation under the First Philippine Republic. However, the Philippine–American War hindered its progress. An improved public school system was established during the first decade of American rule upon the recommendation of the Schurman Commission. Free primary instruction that trained people for the duties of citizenship and avocation was enforced by the Taft Commission per instructions of President William McKinley. Chaplains and non-commissioned officers were assigned to teach using English as the medium of instruction. A highly centralized public school system was installed in 1901 by the Philippine Commission and legislated by Act No. 74. Act No. 74 exposed a severe shortage of qualified teachers. As a result, the Philippine Commission authorized the Secretary of Public Instruction to bring more than 1,000 teachers from the United States, who were called the Thomasites, to the Philippines between 1901 to 1902. These teachers were scattered throughout the islands to establish barangay schools. The same law established the Philippine Normal School (now the Philippine Normal University) to train aspiring Filipino teachers. The high school system was supported by provincial governments and included special educational institutions, school of arts and trades, an agricultural school, and commerce and marine institutes, which were established in 1902 by the Philippine Commission. ^ "Education gets lion’s share of 2014 Budget". ^ a b c d "21M students troop to schools today". ^ "K-12 Primer as of 20 December 2011". ^ Knights of Columbus. Catholic Truth Committee (1913). The Catholic encyclopedia: an international work of reference on the constitution, doctrine, discipline, and history of the Catholic Church. Encyclopedia Press. pp. 16. ^ Arcilla, José S. (1998). An Introduction to Philippine History. Ateneo University Press. p. 50. ^ a b c Country Studies: Philippine Education. Retrieved January 24, 2009. ^ Schumacher, John N. (1997). The Propaganda Movement, 1880-1895: The Creation of a Filipino Consciousness, the Making of Revolution. Ateneo University Press. pp. 23. ^ Republic Act No. 6655, Chan Robles Law Library. ^ Republic Act No. 7323, Chan Robles Law Library. ^ Republic Act No. 7722, Chan Robles Law Library. ^ Republic Act No. 7796, Chan Robles Law Library. ^ Saving Philippine education (archived from the original on 2009-02-10). ^ FACT SHEET BASIC EDUCATION STATISTICS (2005-2010), (archived from the original on 2011-05-11), deped.gov.ph. ^ a b "TVET in the Philippines". UNESCO-UNEVOC. 2014. Retrieved 4 August 2014. ^ "Foreign Students". Ched.gov.ph. Retrieved 2010-07-29. For school year 2010–2011, there are forty-seven (47) madaris in the ARMM alone. The SMC is a combination of the RBEC subjects (English, Filipino, Science, Math, and Makabayan) and the teaching of Arabic and Islamic studies subjects. Since 2005, the AusAID-funded Department of Education project Basic Education Assistance for Mindanao (BEAM) has assisted a group of private madaris seeking government permit to operate (PTO) and implement the SMC. To date, there are 30 of these private madaris scattered throughout Regions XI, XII and the ARMM. While there has been recognized Islamic schools, i.e. Ibn Siena Integrated School (Marawi), Sarang Bangun LC (Zamboanga), and Southwestern Mindanao Islamic Institute (Jolo), their Islamic studies curriculum varies. With the Department of Education-authorized SMC, the subject offering is uniform across these private madaris. In 2004, the Department of Education adopted DO 51, putting in place the teaching of Arabic Language and Islamic Values for (mainly) Muslim children in the public schools. The same order authorized the implementation of the Standard Madrasa Curriculum (SMC) in the private madaris (Arabic for schools, the singular form is Madrasa). Chinese schools add two additional subjects to the core curriculum, Chinese communication arts and literature. Some also add Chinese history, philosophy and culture, and Chinese mathematics. Still, other Chinese schools called cultural schools, offer Confucian classics and Chinese art as part of their curriculum. Religion also plays an important part in the curriculum. American evangelists founded some Chinese schools. Some Chinese schools have Catholic roots. There are other types of schools such as private schools, preparatory schools, international schools, laboratory high schools, and science high schools. Several foreign ethnic groups, including Chinese, British, Americans, Koreans, and Japanese operate their own schools. Formal technical and vocational education starts at secondary education, with a two year curriculum, which grants access to vocational tertiary education.Non-formal technical and vocational education is assumed by institutions usually accredited and approved by TESDA: center-based programs, community-based programs and enterprise-based training, or the Alternative Learning System (ALS). The Institutions may be government operated, often by provincial government, or private. They may offer programs ranging in duration from a couple of weeks to two-year diploma courses. Programs can be technology courses like automotive technology, computer technology, and electronic technology; service courses such as caregiver, nursing aide, hotel and restaurant management; and trades courses such as electrician, plumber, welder, automotive mechanic, diesel mechanic, heavy vehicle operator & practical nursing. Upon graduating from most of these courses, students may take an examination from TESDA to obtain the relevant certificate or diploma. Secondary students used to sit for the National Secondary Achievement Test (NSAT), which was based on the American National Achievement Test are administered to third- and fourth-year students respectively. Neither the NSAT nor NAT have been used as a basis for being offered admission to higher education institutions, partly because pupils sit them at almost the end of their secondary education. Instead, higher education institutions, both public and private, administer their own College Entrance Examinations (CEE) (subjects covered will depend on the institutions). Vocational colleges usually do not have entrance examinations, simply accepting the Form 138 record of studies from high school, and enrolment payment. In selective schools, various languages may be offered as electives, as well as other subjects such as computer programming and literary writing. Chinese schools have language and cultural electives. Preparatory schools usually add some business and accountancy courses, while science high schools have biology, chemistry, and physics at every level. The Department of Education specifies a compulsory curriculum for all high schooling, public and private. Grade 7 has five core subjects, Mathematics 7, Science 7, English 7, Filipino 7, and Asian History. The Grade 8 curriculum has Mathematics 8, Science 8,English 8, Filipino 8, and World History. Grade 9 has Mathematics 9, Science 9, Filipino 9, English 9, and Economics. The final fourth year curriculum(as of S.Y. 2014-2015) has Calculus, Advanced Algebra, Physics, Filipino IV, Literature, and Economics. Minor subjects may include Health, Music, Arts, Technology and Home Economics, and Physical Education. 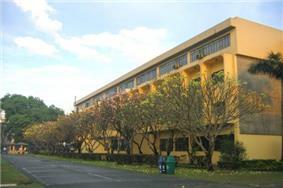 Secondary school in the Philippines, more commonly known as "high school" (Filipino: paaralang sekundarya, sometimes mataas na paaralan), consists of four levels largely based on the US school system as it existed until the advent of the comprehensive high schools in the US in the middle of the 20th century. The Philippine high school system has not significantly evolved from where it was when the Philippines achieved independence from the United States in 1946. It then consists of only four levels with each level partially compartmentalized, focusing on a particular theme or content. The former high school system is now called "Junior High School". PSHS Main Campus. There is a disparity between rural and urban education facilities in the Philippines. Though elementary schooling is compulsory, as of 2010 it was reported that 27.82% of Filipino elementary-aged children either never attend or never complete elementary schooling, usually due to the absence of any school in their area, education being offered in a language that is foreign to them, or financial distress. In July 2009, the Department of Education moved to overcome the foreign language issue by ordering all elementary schools to move towards initial mother-tongue based instruction (grades 1–3). The order allows two alternative three-year bridging plans. Depending on the bridging plan adopted, the Filipino and English languages are to be phased in as the language of instruction for other subjects beginning in the third and fourth grades. The Department of Education expects over 13.1 million elementary students to be enrolled in public elementary schools for school year 2009–2010. Until 2004, primary students traditionally took the National Elementary Achievement Test (NEAT) administered by the Department of Education, Culture and Sports (DECS). It was intended as a measure of a school's competence, and not as a predictor of student aptitude or success in secondary school. Hence, the scores obtained by students in the NEAT were not used as a basis for their admission into secondary school. During 2004, when DECS was officially converted into the Department of Education, the NEAT was changed to the National Achievement Test (NAT) by the Department of Education. Both the public and private elementary schools take this exam to measure a school's competency. As of 2006, only private schools have entrance examinations for secondary schools. DECS Bilingual Policy is for the medium of instruction to be Filipino for: Filipino, Araling Panlipunan, Edukasyong Pangkatawan, Kalusugan at Musika; and English for: English, Science and Technology, Home Economics and Livelihood Education. Article XIV, Section 7 of the 1987 Philippine constitution mandates that regional languages are the auxiliary official languages in the regions and shall serve as auxiliary media of instruction therein. As a result, the language actually used in teaching is often a polyglot of Filipino and English with the regional language as the foundation, or rarely the local language. Filipino is based on Tagalog, so in Tagalog areas (including Manila), Filipino is the foundational language used. International English language schools use English as the foundational language. Chinese schools add two language subjects, such as Min Nan Chinese and Mandarin Chinese and may use English or Chinese as the foundational language. The constitution mandates that Spanish and Arabic shall be promoted on a voluntary and optional basis. Following on this, a few private schools mainly catering to the elite include Spanish in their curriculum. Arabic is taught in Islamic schools. On December 2007, the Philippine president Gloria Macapagal Arroyo announced that Spanish is to make a return as a mandatory subject in all Filipino schools starting in 2008, but this didn't come into effect. From Grades 1-3, students will be taught using their mother tongue, meaning the regional languages of the Philippines will be used in some subjects (except Filipino and English) as a medium of instruction. It may be incorporated as a separate subject. But from Grade 4, Filipino and English as a medium of instruction will then be used. In public schools, the core/major subjects that are introduced starting at Grade 1 include mathematics, Filipino, and Araling Panlipunan (this subject is synonymous to social studies). English is only introduced after the second semester of Grade 1. Science is only introduced starting Grade 3. Minor subjects then include music, arts, physical education, and health (abbreviated as MAPEH). In private schools, subjects in public schools also include those of the public schools, with the additional subjects including: computer education and HELE (stands for home economics and livelihood education). In Christian and Catholic schools, religious education is also part of the curriculum. International schools also have their own subjects in their own language and culture. Elementary school level education covers a shallower but wider range of information than the junior and senior high schools because of the spiral approach educational technique. Elementary school, sometimes called primary school or grade school (Filipino: paaralang elementarya, sometimes mababang paaralan), is the first part of the educational system, and it includes the first six years of compulsory education (Grades 1–6). These grades are further grouped (informally) accordingly into: primary level, which includes the first three grades (Grades 1–3), and intermediate level, which includes the last three grades (Grades 4–6). 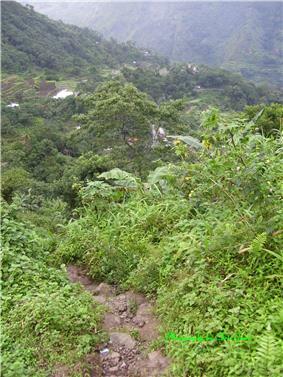 Only access from roadside (mid centre) to Upper Uma Elementary School Kalinga (behind) is via this one hour mud climb. Viewed December 2008. 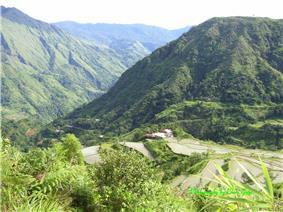 Upper Uma Elementary School, Pasil Valley, Upper Kalinga, viewed from Ag-gama track, July 2008. Note distance from road (centre left). 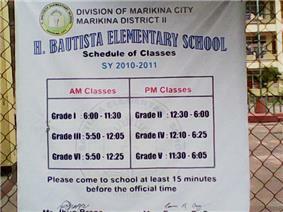 Signage showing the different shifts for students attending the H. Bautista Elementary School in Marikina, Metro Manila. Starting in the 2010–11 school year, different year levels are given different class hours and are scheduled to go to school in different shifts to compensate for the lack of school buildings, teachers, and materials. Is it a new grade? Did it now become compulsory? Did it have a new name? Current 4th Year students in high school in the 2014-2015 school year are exempted from this program. Technical-vocational-livelihood, which specializes in vocational learning. A student can obtain a National Certificate Level II (NC II), provided he/she passes the competency-based assessment of the Technical Education and Skills Development Authority. This certificate improves employability of graduates in fields like agriculture, electronics, and trade. Sports and arts, which is responsible for educating senior high school students in the fields of sports and arts. In kindergarten, the pupils are mandated to learn the alphabet, numbers, shapes, and colors through games, songs, and dances, but in their mother tongue; thus after Grade 1, every student can read on his/her mother tongue. The 12 original mother tongue languages that have been introduced for the 2012-2013 school year are Bahasa Sug, Bikolano, Cebuano, Chabacano, Hiligaynon, Iloko, Kapampangan, Maguindanaoan, Meranao, Pangasinense, Tagalog, and Waray. 7 more mother tongue languages have been introduced for the 2013-2014 school year. These are Ibanag, Ivatan, Sambal, Akeanon, Kinaray-a, Yakan and Surigaonon. In Grade 1, the subject areas of English and Filipino are taught, with a focus on "oral fluency". In Grade 4, the subject areas of English and Filipino are gradually introduced, but now, as "languages of instruction". Currently in high school, Physics is taught in 4th Year, but with the effect of the K—12 program, these subjects are connected and integrated from Grades 7 to 10 with the use of the spiral progression method in teaching. This will also be implemented in mathematics. The high school from the former system will now be called junior high school, while senior high school will be the 11th and 12th year of the new educational system. It will serve as a specialized upper secondary education. In the senior high school, students may choose a specialization based on aptitude, interests, and school capacity. The choice of career track will define the content of the subjects a student will take in Grades 11 and 12. Senior high school subjects fall under either the core curriculum or specific tracks. Core curriculum learning areas include languages, literature, communication, mathematics, philosophy, natural sciences, and social sciences. Phase I: Laying the Foundations. Its goal is to finally implement the universal kindergarten, and the "development of the (entire) program". Phase II: Modeling and Migration. Its goal is to promote the enactment of the basic education law, to finally start of the phased implementation of the new curriculum for Grades 1 to 4 and 7 to 10, and for the modeling of the senior high school. Phase III: Complete Migration. Its goal is to finally implement the Grades 11 and 12 or the senior high school, and to signal the end of migration to the new educational system. Phase IV: Completion of the Reform. Its goal is to complete the implementation of the K-12 education system. In 2011, the Department of Education started to implement the new K-12 educational system, which also included a new curriculum for all schools nationwide. The K-12 program has a so-called "phased implementation", which started in S.Y 2011-2012. The start of the twenty-first century's second decade saw a major improvement in the Philippine education system. In January 2009, the Department of Education signed a memorandum of agreement with the United States Agency for International Development to seal $86 million assistance to Philippine education, particularly the access to quality education in the Autonomous Region in Muslim Mindanao (ARMM), and the Western and Central Mindanao regions. In 2005, the Philippines spent about US$138 per pupil compared to US$3,728 in Japan, US$1,582 in Singapore and US$852 in Thailand. In August 2001, Republic Act 9155, otherwise called the Governance of Basic Education Act, was passed. This act changed the name of the Department of Education, Culture and Sports (DECS) to the Department of Education and redefined the role of field offices (regional offices, division offices, district offices and schools). The act provided the overall framework for school empowerment by strengthening the leadership roles of headmasters and fostering transparency and local accountability for school administrations. The goal of basic education was to provide the school age population and young adults with skills, knowledge, and values to become caring, self-reliant, productive, and patriotic citizens. The Congressional Commission on Education (EDCOM) report of 1991 recommended the division of DECS into three parts. On May 18, 1994, the Congress passed Republic Act 7722, the Higher Education Act of 1994, creating the Commission on Higher Education (CHED), which assumed the functions of the Bureau of Higher Education and supervised tertiary degree programs. On August 25, 1994, the Congress passed Republic Act 7796, the Technical Education and Skills Development Act of 1994, creating the Technical Education and Skills Development Authority (TESDA), which absorbed the Bureau of Technical-Vocational Education as well as the National Manpower and Youth Council, and began to supervise non-degree technical-vocational programs. DECS retained responsibility for all elementary and secondary education. This threefold division became known as the "trifocal system of education in the Philippines". On February 3, 1992, the Congress enacted Republic Act 7323, which provided that students aged 15 to 25 may be employed during Christmas and summer vacation with a salary not lower than the minimum wage-- with 60% of the wage paid by the employer and 40% by the government. On May 26, 1988, the Congress of the Philippines enacted the Republic Act 6655 and the Free Public Secondary Education Act of 1988, which mandated free public secondary education commencing in the school year 1988–1989. In 1987, the Ministry of Education, Culture and Sports became the Department of Education, Culture and Sports under Executive Order No. 117. The structure of DECS as embodied in the order remained practically unchanged until 1994. On February 2, 1987, a new Constitution for the Philippines was ratified. Section 3, Article XIV of the 1987 Constitution contains the ten fundamental aims of education in the Philippines. It is also seen that under the 1987 Constitution (under Section 2 (2), Article XIV), only elementary school was made compulsory. The Education Act of 1982 provided for an integrated system of education covering both formal and non-formal education at all levels. Section 29 of the act sought to upgrade education institutions' standards to achieve "quality education", through voluntary accreditation for schools, colleges, and universities. Section 16 and Section 17 upgraded the obligations and qualifications required for teachers and administrators. Section 41 provided for government financial assistance to private schools. This act also created the Ministry of Education, Culture and Sports. In 1978, by the Presidential Decree No. 1397, the Department of Education and Culture became the Ministry of Education and Culture. On September 24, 1972, by Presidential Decree No. 1, the Department of Education, Culture and Sports was decentralized with decision-making shared among thirteen regional offices. Develop moral character, self-discipline, and scientific, technological and vocational efficiency. In 1972, the Department of Education became the Department of Education and Culture under Proclamation 1081, which was signed by President Ferdinand Marcos. In 1947, under Executive Order No. 94, the Department of Instruction was changed to the Department of Education. During this period, the regulation and supervision of public and private schools belonged to the Bureau of Public and Private Schools. Two decades later, enrollment in elementary schools was about one million (up from about 150,000 in 1901), and about 100,000 in high school (up from less than 20,000 in 1901). The emergence of high school education in the Philippines, however, did not happen until 1910. It was borne out of the rise in big businesses and technological advances in factories and the emergence of electrification, which required skilled workers. In order to meet this new job demand, high schools were created and the curriculum focused on practical job skills that would better prepare students for professional white collar or skilled blue collar work. This proved to be beneficial for both the employer and the employee; the investment in human capital caused employees to become more efficient, which lowered costs for the employer, and skilled employees received a higher wage than employees with just primary educational attainment.